The first leaf of Fall. Maple. The girls found it today. Curled in burnt orange on the front lawn. We celebrated. Mount Olympus is baring spots of crimson. The scrub oaks are flaming. Fall is on its way. The nights are cooler. And this week we’ve had Virginia rain. Heavy downpours that make me miss our slice of Fairfax home where I loved to watch swollen clouds soak our scrap of green outside the back window. I love Autumn. It’s my favorite season. So I want to live in the present. Be in it. Immersed. As best I can with two new little boys wrapped at my middle and three toddling girls milling around my feet. But I’m constantly behind. A two-day turnaround with phone calls, weeks of emails to respond to, thank you notes still unwritten, bottles in the sink – usually unwashed. And always a blog post on my mind. Simply because I want to capture the best, the frustrating, the funny. So tonight. Finally. I write. It’s 1AM. And I’m going to post an update. An update by the numbers. An abbreviated rundown on our steadily evolving household. After that, I intend to write a couple summer wrap-up posts. Maybe then I will be caught up. In the moment. Present. I know. Wishful thinking. But a Mother can dream, can’t she? Alright. Let’s start at the bottom (pun intended). Usual number of diapers changed in one day: 24. That’s down from the 40 I was changing when the boys first came home. With 4 bottoms to keep clean we average a new delivery of 4 boxes every few weeks. 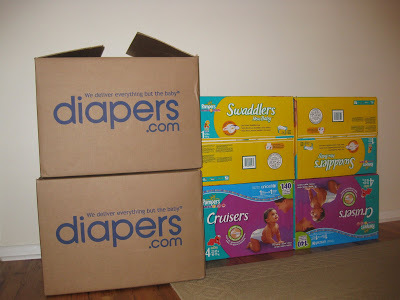 If you have kiddos in diapers, check out this site. diapers.com. Free shipping for orders over $49.00. Same price as Target and Wal-Mart (sometimes cheaper with coupons). But they arrive at your door in 24-48 hours! Fast! Number of showers in a week:3. Slightly improved since my last confession of 2. Number of hours it takes to do the breakfast dishes: 5. Someone needs something ALL the time. I move from one pressing need to the next. From one cry, to one messy diaper, to finding one binky, to mediating one conflict, to one time-out, to one “will you read me this book Mommy?” to one conversation, to finding a clean set of clothes, to one hug, to one cup of water… you get the drift. I rinse a plate here. Another plate there. Number of girls Emilie can pack into her vehicle: 6. Her three and my three. Thanks Em – for taking my girls so often and for being such a creative, engaged Mom. They love being with you! Number of friends who continue to offer help:Myriad. I’m feeling SO thankful. We’ve had so much help. At just the right times. In just the right amount. This is my friend Kristen, who left her five children one evening (including her own twin girls) to come and help with my five. She brought dinner – complete with chocolate milk straws for the girls! Samsel – I love you. Isn’t this a great action shot? Yep – that IS spit up you see coming out of Gordon’s mouth. Minutes when all four twins are asleep and Eliza is at preschool: 45. Golden. But far too short! Number of smiles from Spencer and Gordon: Countless. The boys are smiling all the time. Cooing. Talking. They save their best smiles for the girls. This is Gordy smiling at Eliza. And below – smiling for her camera! Gordon has a dimple on his right cheek. Just like Sami. He has this precious half smile that he loves to tease us with. He smiles, then blinks his eyes and looks away. His own little game of hide and seek. I love to kiss his darling face. Spencer’s smile is sweet. Prolonged. He locks eyes with you and smiles long and genuine. He brought me to tears the other night as he studied my face. I couldn’t move my eyes from his. My throat tightened and my eyes watered as I kissed his satin forehead and told him how much I loved him. Number of O’s (Oxygen) Spencer is on: Zero!! Jessica (our favorite NICU nurse) came to visit a couple weeks ago. While she was here we tried Spencer on room air again. He did well. His % saturation stayed in the 90s. I kept him off for the next three nights, monitoring him during sleep. The bells only sounded once or twice and the following Monday I had Home Health come and take everything out of the house (M tank, tubing, oximeter). I felt like a new woman. Spencer was a new man. We were free to move around the house with ease. Go outside for walks. Cuddle and feed more easily. This was a huge milestone. And we still think it was your touch Jessica. Thanks for coming! Look how cute you are holding both the boys. What a pro! Hours of continuous sleep Mom is getting: 4. Feeling like I can take on the world with a bit more energy (and intelligence). That was three weeks ago. I suspect they are closer to 12 lbs. now. They will be 4 months beginning of October! Above: Gordon (L). Spencer (R). The “tie” onesies were given to us by a neighbor. Future missionaries? A job on Wall Street? Could be anything! Years of promise ahead! Number of hours in the swings per day: 2. Rough estimate. I’m not really sure. But the boys spend at least 15 minutes in the swings before every nap because I can’t rock them both to sleep. And if they wake early – when I don’t have my act together yet to feed them – into the swings they go. All I can say is – hallelujah for baby swings! Record number of kids crying at one time: 5! During moments like this, I feel like I should cry too! Wouldn’t want to be left out! Today all four were crying (Eliza was at preschool). While I was trying to console Spencer and Gordon who woke early from their naps, Ali came into their bedroom. I began to shoo her out. In my haste to shut the door I didn’t notice her fingers in the crack of the door. OUCH! I impinged her squishy fingers! Tears! Tears! Tears! Only seconds later, already feeling like an awful Mom, I maimed my last calm child. I was holding Spencer (who was crying) and began to help Sami off the stool in the bathroom. I shut a drawer, not knowing her fingers were in the way. More tears! I felt horrible. Number of days in the week I don’t do the girls’ hair: 4. This number changes, depending on the week. Typically, it coincides with the days I don’t get out of my pajamas. But this stat IS improving. The above “Ali-do” is a post-pigtail day. I think she looks like one of those reptiles with gills that flare out as a defense mechanism. If you know the name of this animal would you PLEASE tell me! I’ve googled and googled and can’t find it! Number of wild and crazy girls: 3. Number of Saturdays in the last 2 months that Doug has been home: 1. Today is the FIRST Saturday Doug hasn’t had to work in over two months! Boo on Fall Tax Season but Hooray for post 9/15 deadline. Hopefully we will see more of Daddy now! Okay. I’m out of numbers. And the creative juices just tapped out. Below are a few more pictures. Eliza with Spencer (I think it’s Spencer). Cristine’s visit. (Eliza took this picture.) Cris – thanks so much for dinner! And adult conversation. It’s been wonderful to connect and see you more often! We love you! This is my friend Cindy. Check her out. Keeping both babies happy before bottle-time. Cindy has been a friend since Junior High. Despite the miles and time, we’ve tried to stay in touch. She called me out of the blue one day to come for a visit. We picked up as if no time had elapsed at all. Since then she has been coming every Thursday night to help me bottle feed and man the house while I make a grocery run. Cindy – I treasure you. And your service (away from your own beautiful family) makes me tear up. You’re inspiring to be around. I love you. Spencer has a cowlick (that combs to the right). Gordon’s hair combs straight forward. Other than that they look very much identical. Our family, however, can tell them apart at a glance. Even the girls. Sometimes they still ask me to be sure. “That Spencer? That Gordon?” Sometimes they’re wrong. But most of the time they’re right. For me, it is their eyes. Not the shape. Not the color. Something deeper. Must be their spirit. Matter created by God. Unique. Individual. Gifted. Their own identity shining through. They feel so different to me. These two darling boys. Well, that’s what this Mommy does. At least for now. And although it feels like all I’ve done is feed babies the last few months, I wouldn’t wish for anything else. This is just the beginning of an exciting journey with five beautiful people I am coming to know and understand. People I will love more than words can express. I had no idea I’d be so smitten. Fantastic post. We can't imagine how you pull it off, but we're so happy to get the updates and hear that everything is working out. The Frill-necked Lizard (Chlamydosaurus kingii), also known as the Frilled Lizard or Frilled Dragon, is so called because of the large ruff of skin which usually lies folded back against its head and neck (courtesy of Wikipedia). Brent. THANK YOU! Complete with scientific name – kingdom, phylum… is that what it is? How are our favorite Soderbloggers?? We miss you guys! What a beautiful post, I too have an Eliza, adorable. You seem like an amazing woman! It is comforting to hear you speak of raising your children. Thank you for sharing. I LOVE LOVE LOVE your posts! And so glad he's off oxygen Cath. You're so lucky to have great friends. And we're so glad Doug was home on Saturday! You are amazing. Your kids can't be any cuter…and funnier. I just smile while reading your posts. Thanks! Is the reptile a gila monster? Thanks Traci. Nice to have you reading. From the looks of your blog, you have a wonderful, busy family life as well. Keep up the great mommy-ing! Darling kids! And Ang – Not sure about the gila. I think Brent may have sleuthed out the true name. Frill-necked Lizard. I'll have to post a picture so everyone can see the likeness. Lizard and Ali. Thanks for your encouragement Ang. We love you! Beautiful post, as usual, Cath. And I'm so happy you and Doug had a night out. The boys look great. I can't wait to stop by spontaneously again. Your life looks so busy! It also looks so blessed!! !